I'm having a difficult time finding a way to "double check" my primary directions calculations. For example Solar Fire's options seem to give very different results than what Zoller calculates in Lesson 20 of primary directions, so I am led to believe that the methods programed in Solar fire are different than those which Zoller uses. I have also tried to check my results against astro.com's calculations and cannot seem to understand why their oblique ascension for the Sun is wildly different from mine. I have no problem doing the calculations by hand, I just want to make sure I am doing them correctly and thus far it seems that Zoller's method, which is derived from Alcabitius and Bonatti, seems not to be what is used by at least these two softwares. I'd be happy to share my calculations step by step if anyone can help me but before I exert all of that effort to put them on the computer I would like to know that there is someone willing to help. I know absolutely nothing about how Bonatti and by extension Zoller taught primary directions, but from my understanding the oldest way to calculate them is Zodiacally through the bounds. I've only seen SolarFire 7 in action, but as I recall it calculated directions "in mundo," taking after Placidus I believe. Perhaps you should try the freeware Morinus program? It has a number of options for calculation which may suit your needs. You might want to ask Martin Gansten who is a moderator on this forum. I graduated from his PDDC course a couple of years ago and wrote primary directions into Delphic Oracle based upon his conventions. There are some confusing naming comventions that you should be aware of (such as the definition of direct and converse). Many modern programs define converse directions as motion going against diurnal rotation, but traditionally there was only one motion (diurnal rotation) and the difference between converse and direct is whether the significator (converse) or promissor (direct) was directed in the diurnal rotation. Martin has called the directing against diurnal motion neo-converse and I've named these 3 types as such in my software. I'm having a difficult time finding a way to "double check" my primary directions calculations......sults than what Zoller calculates in Lesson 20 of primary directions, ...................computer I would like to know that there is someone willing to help. Scroll down to 'III.Prediction' and you will find several helpful files. First is 'Technical Notes on Primary Directions' which should answer all your questions. I was one of the first to graduate from Zoller's course and wrote this set of technical notes to make the calculation method easier to understand. Right under that link is a set of excel files for download which are used to show how to implement the calculations into Excel. 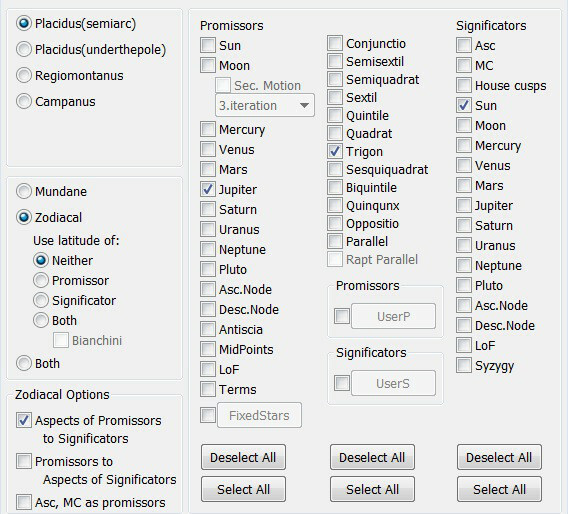 There are other links further down the research page which demonstrate the full range of primary directions for the Regulus USA National Horoscope of my design. So may your problem was this...? Or if you was looking only for to compare results with "yours" so I think the other programs, which some user posted before, may help... as Morinus (free -program) etc. As Kolev says Alcabitius directions are semi arc directions, ie Ptolemaic method, just numbers are arranged in a different way. Wow thanks so much to everyone. All of this is very helpful and I have a lot of reading to do! I cannot seem to get Morinus to be accurate when I enter the data for a chart... I put in the correct GMT Long Lat etc and it is clearly incorrect when compared with other software... any suggestions? What am I missing? New York is in fact GMT -5, not GMT +5. As a rule, longitudes west of the Greenwich Meridian are plus and longitudes East of the Meridian are minus. When programs like Solar Fire say that New York is +5:00, they in fact mean that you add 5:00 to get the Greenwich time. Confusing, I know! Okay now I have once again hit a wall... in Morinus software it gives the Sun converse directed to the MC as 59.457, which is very close to my own calculation... but where I am confused is it also shows the MC being directed to the Sun and the arc of direction given is 71.248... now I thought that any directions involving the MC are super simple as you are just getting the difference between its RA and another body or point's RA... the RA of the Sun is 3d38m and the RA of the MC is 63d05m... how then can the arc of direction when calculated east to west (MC moving to Sun's position) add up to 71.248??? And how can it be different than the converse direction?? ?